“Old & New in Shona Religion” is a multimedia project showcasing the photography and narration of Dr. M. L. Daneel. 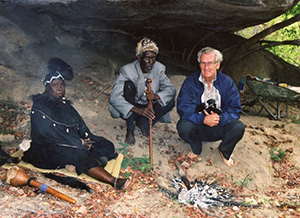 Professor emeritus at BU’s School of Theology, Daneel spent decades researching indigenous Christianity among the Shona people of southern Africa. He lived among the Shona during Zimbabwe’s long liberation struggle. Afterwards, he was one of the few westerners trusted to work in traditional African and Christian congregations. Daneel helped to build and maintain a tree-planting movement at the war’s end to unite communities riven by political and sectarian divisions. Through it all, Daneel took photographs to document traditional and innovative religious practices. BUs Center for Global Christianity & Mission hosts this series of short multimedia pieces in which Daneel provides explanation of and context for selections for the digitized archive of his photographs. Working with project director Eva Pascal, I served as audio engineer and multimedia producer.